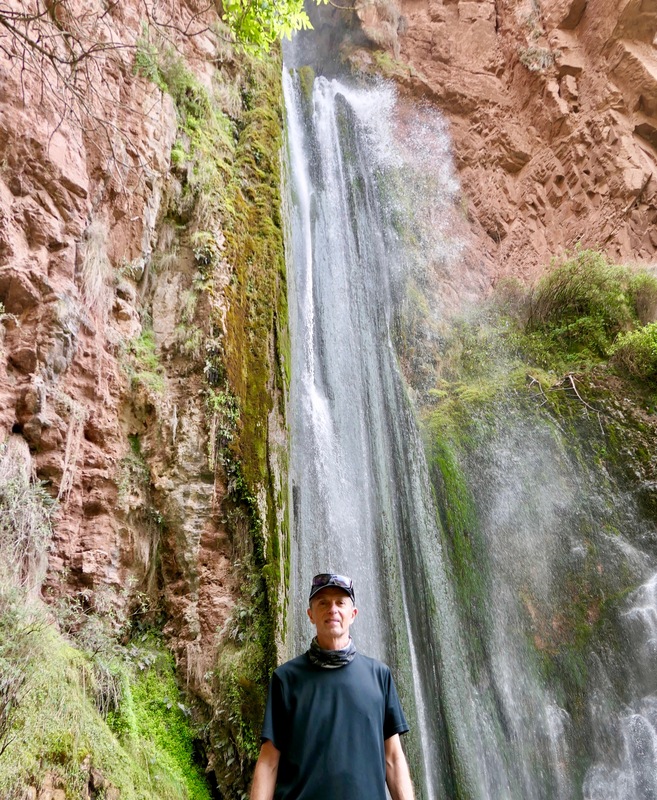 I’m in Peru, preparing to hike the Inca Quarry Trail and visit Machu Picchu. To read “High old time (Part 1),” please see the previous post. 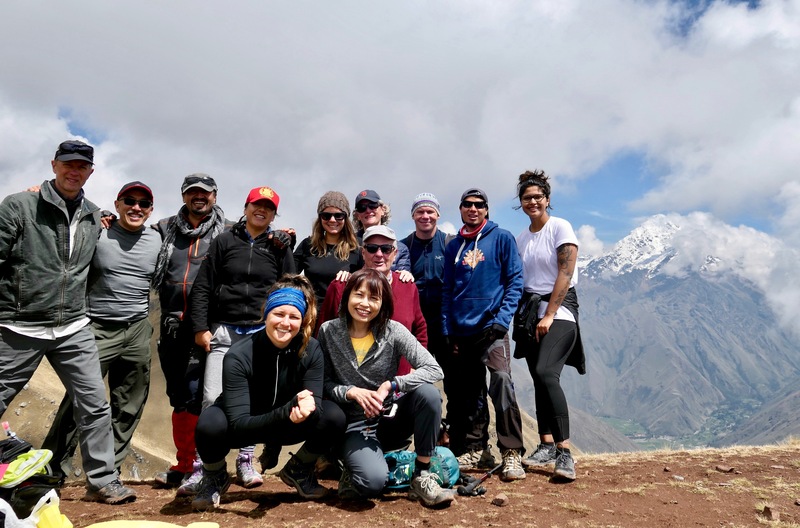 After breakfast, our group of nine turned in our packed duffels and left Cusco in the rain. The day cleared as our van headed toward the Sacred Valley, an area that has supported farming for centuries. Both sides of the Urubamba River are terraced for growing crops. The van turned onto a dirt road and climbed through adobe villages into the mountains. Election signs were painted boldly in black and red on whitewashed stone walls. Twice we were stopped by herds of sheep in the road. We pulled into the small village of Qorqor, which sits at an elevation of 2-1/2 miles high. Its population is less than two-hundred. There, we were met by a pan flutist, a drummer and several women, brightly dressed in monteras (sombrero-style hats), pleated skirts and leggings. They welcomed us with much fanfare, perhaps because they hoped we would soon be buying some of their handicrafts. The women lifted garlands of flowers around our necks, took our hands and danced with us. We promenaded through the gates of their village toward a community center. Inside, the leader of the group asked us to identify ourselves, one by one–name, age, country of origin, and marital status. They seemed fascinated by our personal information. Ironically, I learned more about the other hikers through this blunt method of interrogation than had been volunteered on its own. The women of the highlands are short, weathered and a bit hunched from years of carrying huge loads on their backs. They speak Kichwa, a language used by an estimated eight million citizens of Peru, Ecuador, Bolivia and northwest Argentina. 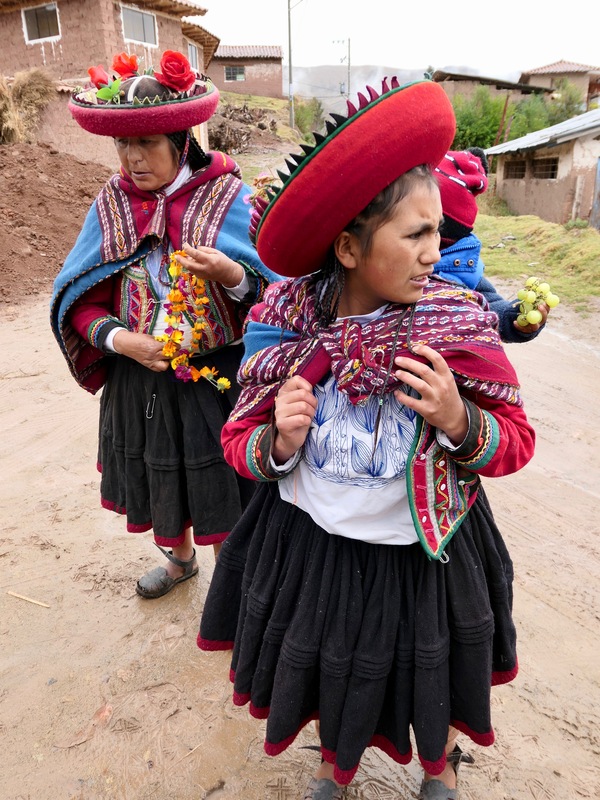 In Peru, Kichwa, along with Spanish, is an official language and the native language of approximately half of the population, most of which lives in the highlands. Carmen, our tour guide, translated for us. The women are members of the Munay Ttica Association. They provide a traditional lunch and a cultural experience in exchange for the opportunity to sell their woven handicrafts. Men in the area average $107 per month in income; women $32. Visits like ours generate another $12 per family. At a long wooden table, they served lunch–chicken soup, quinoa cakes, veggies and coca tea. 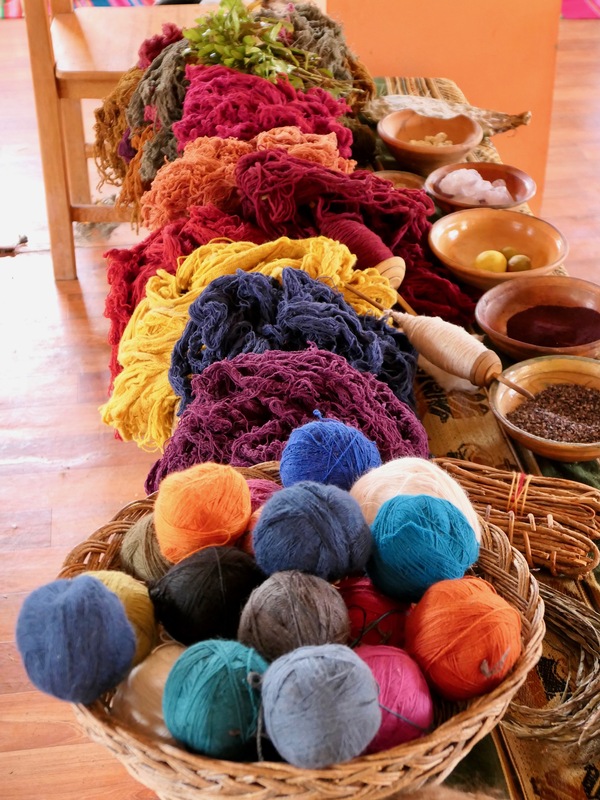 Afterward, the women identified the sources of the natural dyes they use. They demonstrated how they wash wool, spin it into yarn and weave their products. Then it was time for commerce. The association members methodically spread their wares around the floor for us to browse. I bought mittens and chullos for my kids. In the courtyard an alpaca was tethered. I managed to make friends without getting bitten. Near the town of Ollantaytambo, we stopped at a dirt-floored shop for a demonstration of the brewing of chicha de jora (corn beer). Guinea pigs ran loose in the hallway. Outside, we played juego de sapo, a game of tossing coins into slots. The loser buys a round of corn beer. 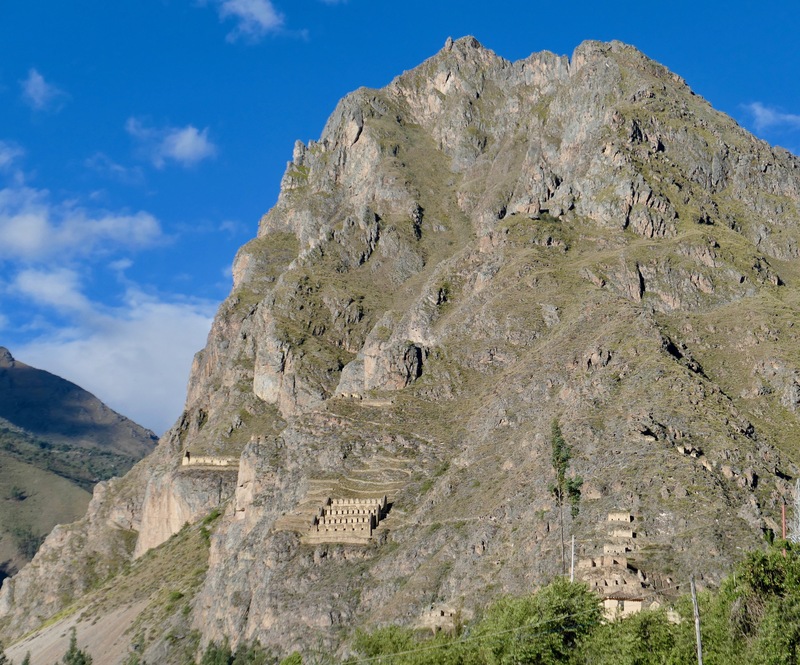 In Ollantaytambo we checked into a hotel on the busy road to the train station. Llamas grazed beside the café tables in the front yard. Gaudy tuk-tuks buzzed up and down the streets. Although Ollantaytambo is nestled along the Urubamba River on the floor of the valley, its elevation is 1-3/4 miles high. On all sides it is hemmed by mountains. The town dates to the late 1400s and contains some of the oldest continuously occupied buildings in South America. The streets of Ollantaytambo were laid out by the Incas in a grid. 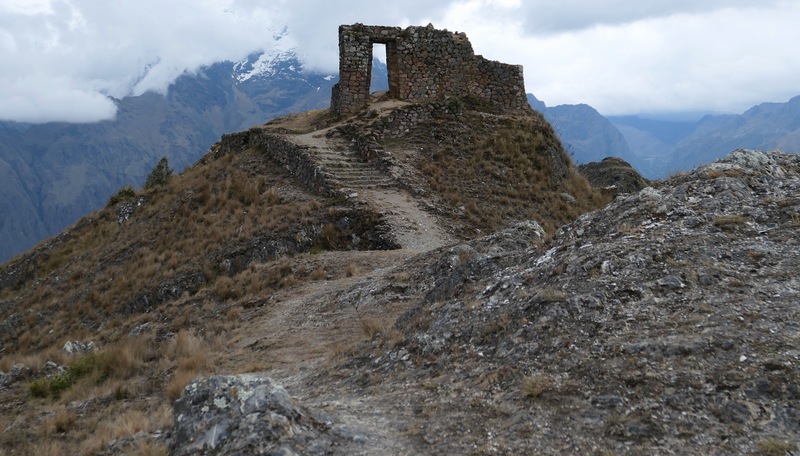 Although colonial buildings have replaced some of the original dwellings in the center of town, many of the Incan foundations are still in place. Carmen led us through the narrow cobblestone streets, pointing out the Incan wall construction, drainage channels and doorways. We entered a walled compound, where a few one-room buildings surrounded a central courtyard. Cats and chickens roamed freely. Guinea pigs scampered nervously at our ankles, trying not to look like dinner. Clinging to the cliff wall above us, the Pinkuylluna grain storehouses glowed yellow in the waning sunlight. Ollantaytambo is where the Incas retreated after their defeat at Sacsaywamán. On a steep hill overlooking the town, they built a fortress and temple. Eventually the Spaniards captured it as well. We ate dinner by candlelight, though not by choice. Upon arrival at the selected restaurant, the electricity went out. Not to worry–our meal was cooked on a propane stove. In the darkness, a street musician played guitar with a pan flute in a holder around his neck, Bob-Dylan style. A popular busking song in Peru is “El Cóndor Pasa.” Simon & Garfunkel covered it on their Bridge over Troubled Water album. The next morning at 5:45 a.m. we left the hotel and headed to the trailhead. Along the way, the van slowed briefly and a man hopped through the sliding door. Over the next few days, we made the obvious jokes about our chef’s name. Feeding the multitude. Turning water into wine. The last supper. Twice more the van paused for drive-by boardings. Francisco, the assistant chef, and a couple of horse wranglers joined us. After a few minutes on a gravel road, we arrived at the launch site. We were already at an altitude of 1-3/4 miles high. 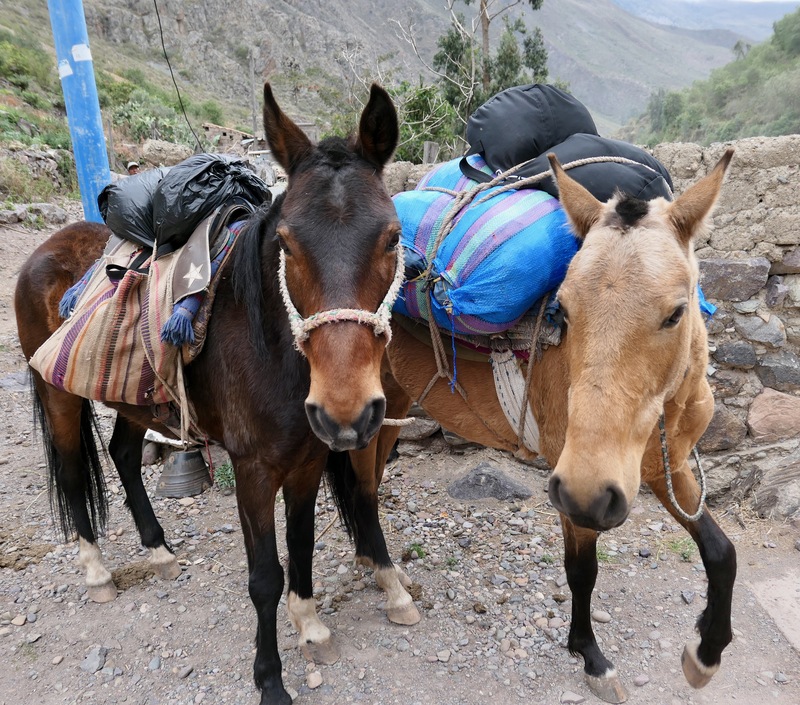 A string of packhorses was waiting for us. Cooking and camping gear were lashed to their backs, along with our duffels. If illness or injury required evacuation, one of us might be lashed to their backs as well. Juan distributed hiking poles and demonstrated how to adjust them. Kleber offered bananas and energy bars for our daypacks. Soon we were off and headed uphill at a rapid pace. The day was sunny and warm. Already, my heart was racing and my breathing labored as I tried to keep pace with Juan. Planting the poles with the technique he had demonstrated, I tried to settle into a rhythm, a few calculated steps at a time and then a short pause. We climbed through an agricultural area, passing adobe homes with tin roofs. Spring crops flourished in the fields below. The day grew warmer and I shed layers. We stopped occasionally to catch our breath and drink water. We bypassed the village of Socma, which sits at two miles high. Higher up we stopped to take photos of a waterfall, Perolniyoc, plunging down the side of a cliff face for the length of a football field. The cool spray from the cascade was refreshing. I began chewing dried coca leaves, which I bought at a shop the day before. The guides suggested I chew three or four at a time. The grassy-tasting leaves dissolve in your mouth, leaving only a wad of leaf veins behind. Coca leaves work as an anesthetic, lessening pain, and as a stimulant, imparting energy. They may also prevent altitude sickness. Incan messengers chewed the leaves during their long runs through the mountains. Coca-Cola was originally a mix of coca-leaf and kola-nut extracts, plus sugar. Supposedly Coke became coca-free in 1929 although the company continued to import leaves until the late 1980s. Coca-infused tea, considered an herbal beverage, is served everywhere in Peru. During the hike, we were given hot coca tea four times a day. Yes, cocaine can be chemically derived from the leaves. However, in leaf or tea form, coca accords essentially the same buzz as a cup of coffee. Or a Coke. We continued upward on a dirt path along the side of the mountain. One by one, the horses and their handlers passed us on the way to the first campsite. A stone ruin, Q’orimarca, emerged from the mist above. As we clambered toward the promontory where it was located, we were suddenly pelted with hail. Colorful plastic ponchos blossomed from backpacks. The storm passed quickly and we were again bathed in bright sunshine. 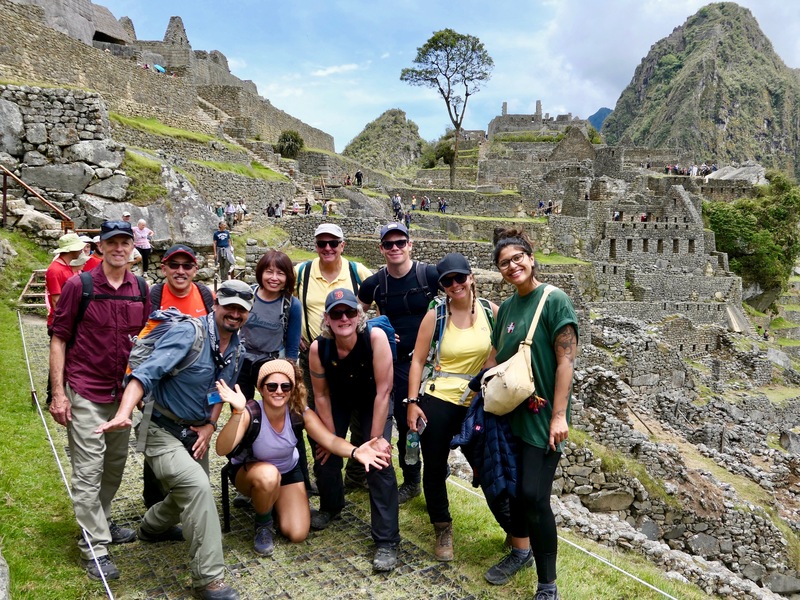 Juan, who is an archaeologist as well as a guide, explained that Q’orimarca was used by the Incas as a watchtower and rest stop on the way to Machu Picchu. It sits at 2-1/4 miles high. From out of nowhere, a highland woman, wearing a bowler and a rainbow of colors emerged. She carried a plastic bucket filled with bottled drinks, available for sale. We climbed higher, through more steep farmland, passing a man plowing a field with two oxen. Back to the Stone Age. Dogs roamed freely. Hogs rooted in the mud. Finally we spotted our two-person tents waiting for us on a lofty terrace at 2-1/3 miles high. We’d climbed half of a vertical mile. Our duffels were waiting for us, piled together on a tarp. The chef was busy in the cook tent. A tent smaller than a phone booth contained a toilet–two plastic buckets. The Chancachuco campsite is near a tiny settlement called Rayan. Not much more than a couple of farm dwellings. Our horses, relieved of their burdens, grazed. Another local woman appeared, offering bottled water and Powerade for sale. After stowing my gear, I joined the others in the dining tent—quinoa soup, salad, fish, rice and coca tea. Outside it began to rain. I crawled into the tent to escape and fell asleep early. Juan advised us not to leave anything outside during the night, as the stray dogs were known to chew hiking boots and run away with hiking poles. We moved our shoes, ripe with horse manure, into the tent for the night. It rained hard for hours. 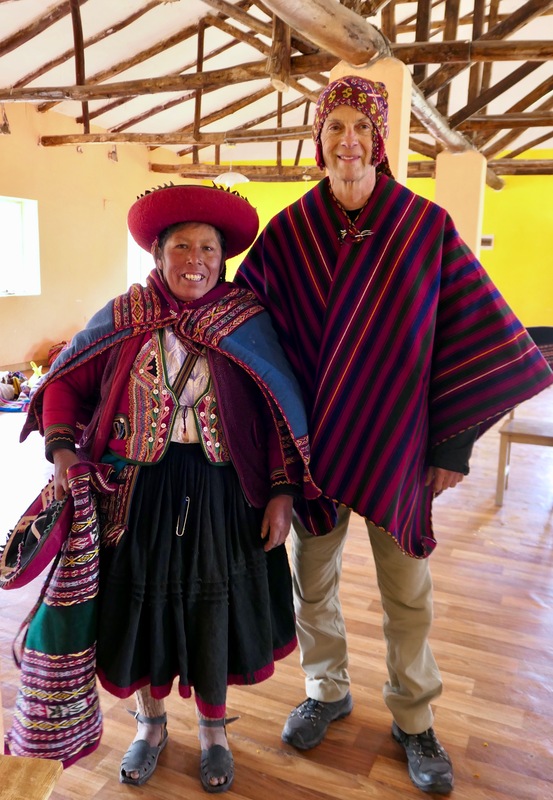 At 5:30 a.m. Juan delivered cups of coca tea and bowls of hot water to the tent. The morning ritual. Our shoes, packs and sleeping bags were wet from last night’s rain. At dawn, white clouds snuggled in the valleys below us, still snoozing. We crowded into the dining tent for breakfast, twelve of us on plastic stools around the table. Today, we set our sights on the two highest passes, both over fourteen-thousand feet. The sun emerged, but the trail was steep and still muddy from the rain. Eventually we climbed above the tree line and into more clouds. Now, the rolling mountains were covered with yellow grass as far as we could see. The trekkers spread out on the trail, each finding a tolerable pace. Sometimes I could only see a couple of them through the fog. I found an even tempo, as if I were scaling an endless stairway. The ascent was steady for a couple of hours. 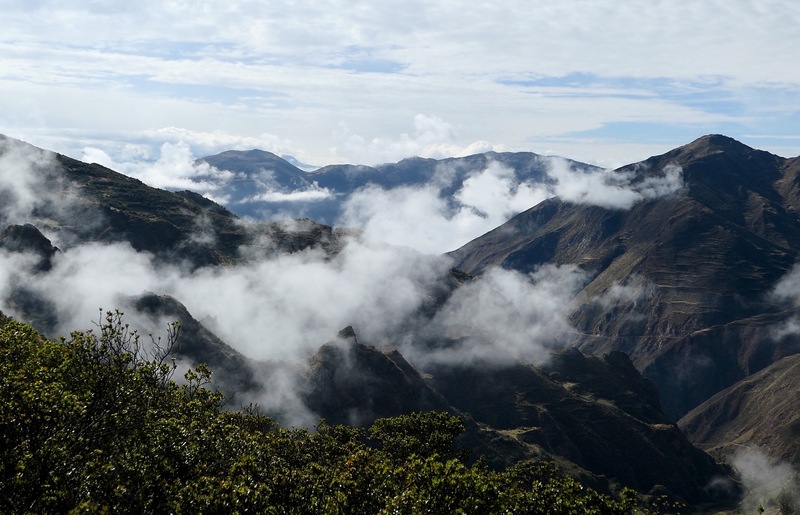 After a long climb, we breathlessly reached our first objective, Puccaqasa, at 14,337 feet, nearly 2-3/4 miles high. Nevado Veronica, one of the highest peaks in the area, was now visible on the horizon. Veronica, at 19,334 feet, is nearly a mile higher than where we were and as high as Mount Kilimanjaro. As the last of our group arrived at the pass, the clouds cleared on Veronica and we saw its glacier in the sun. We rested, snacked, took a team photo and moved on. The trail between the two passes undulated. Midway, we stopped at a small rocky brook where the support staff had set up the cooking, dining and toilet tents. The horses grazed, while we ate lunch. 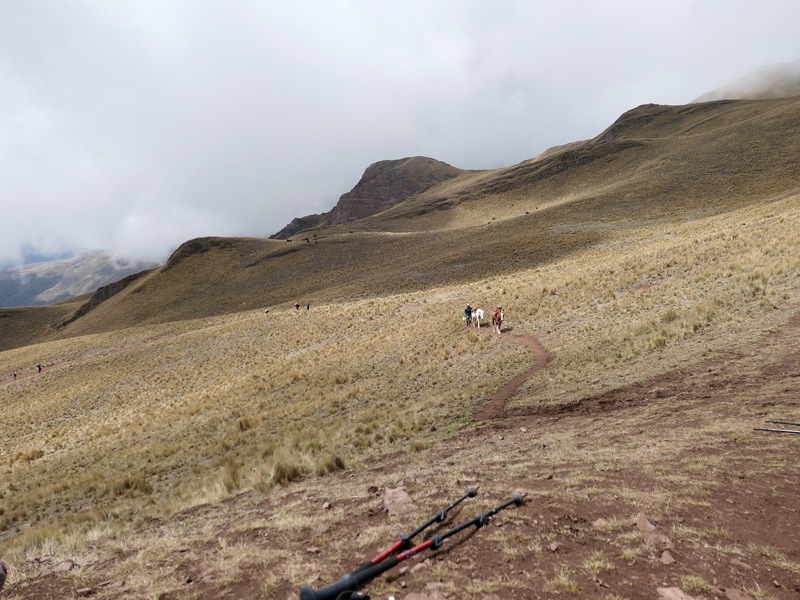 We headed onward through steep tree-less meadows to the second pass, Kuychicassa. One by one, we reached the summit, a grassy knoll. We congratulated each other. 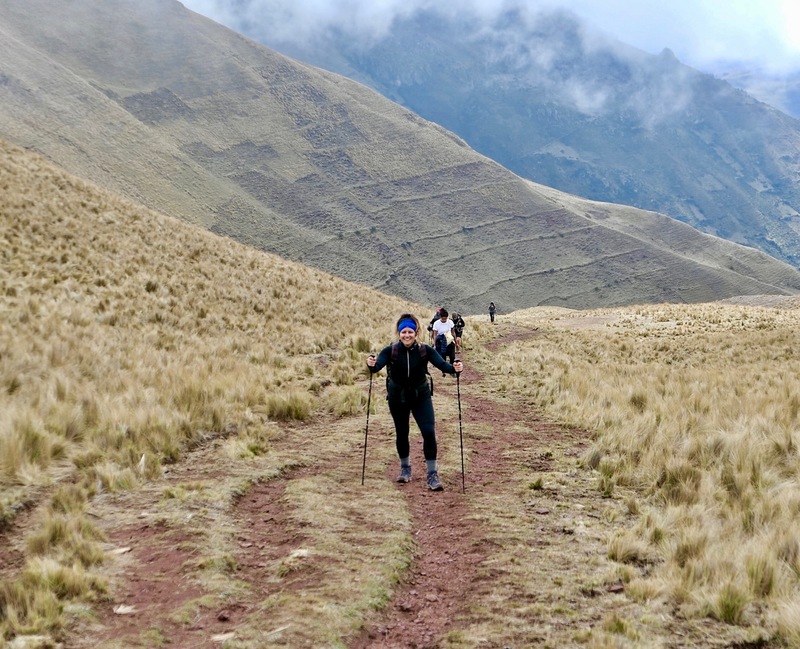 The pass tops out at 14,600 feet, our highest elevation on the hike and a mile higher than Machu Picchu. 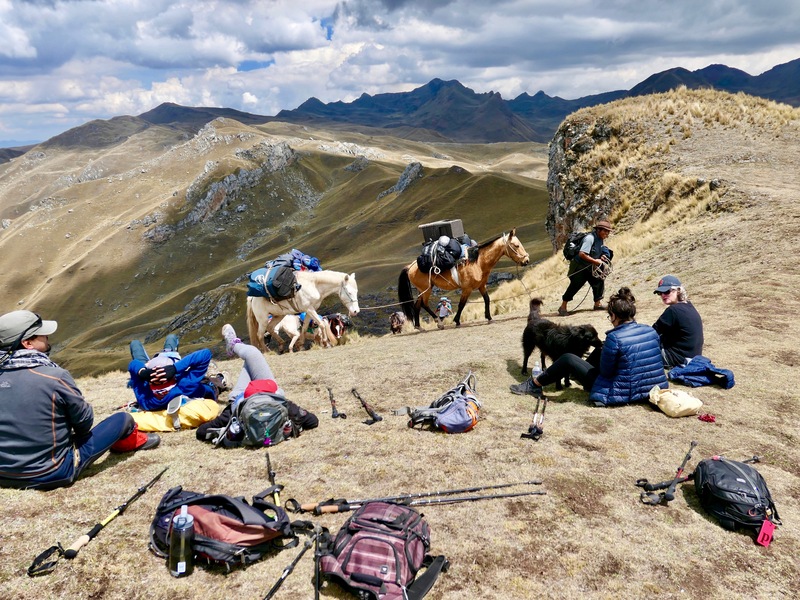 For a while, we reclined on the ground, hydrating, eating energy bars, and enjoying the three-hundred-and-sixty-degree view. The horses, loaded with our gear, leapfrogged us again on their way to tonight’s camp. In the near distance, thunderstorms rolled, skirting peaks and racing through valleys. We watched dark clouds unload in the next valley, but we were spared. The most difficult part of the day was just ahead. A long, steep, treacherous downhill trek through loose rocks. Our course was more of a rockslide than a trail. Depending, of course, upon whether or not I fell. I am sure he has told this joke before. Juan showed us how to plant both poles ahead of our steps to keep from slipping. I took each step with caution. I slid on loose gravel anyway. The descent was torturous and seemingly endless. My old knees were exhausted from bracing against falls. Younger knees raced ahead. Finally, we emerged onto a grassy ridge. At the far end was Intipunku, one of many Incan sun gates. Juan called it the “Door of the Wind.” Snow-capped Veronica peeked through its doorway. After posing for photos, we made the long descent into camp. Nearby were the stone ruins of Choquetacarpo, formerly the residences of Incan quarry workers. 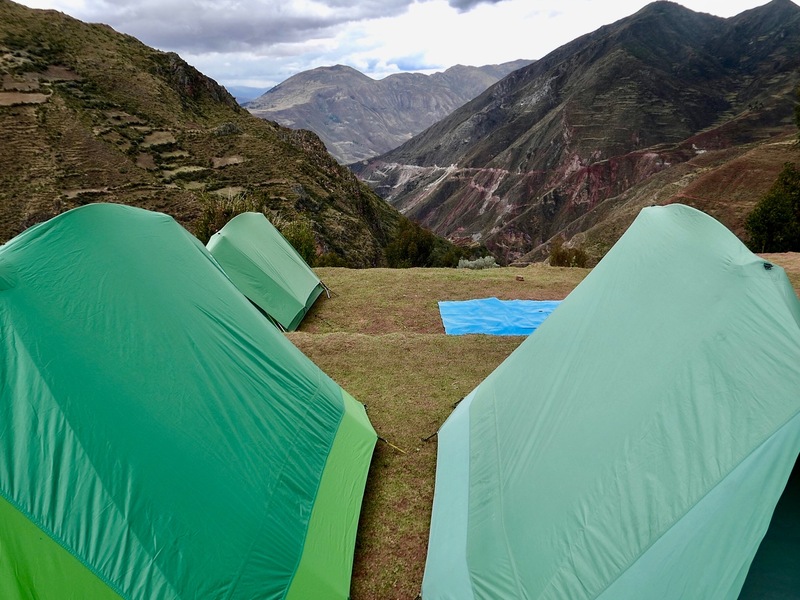 Our tents were perched right on the edge of a cliff overlooking the Sacred Valley. Down below, lights flickered in Ollantaytambo. We were 2-1/4 miles high. I thought I might fall over the edge when I stepped outside to visit the Incan toilet during the night. Carmen collected soles (Peruvian dollars) from each of us to tip the camp staff. The tour operator, Intrepid, employs only natives, so tipping helps the local economy. 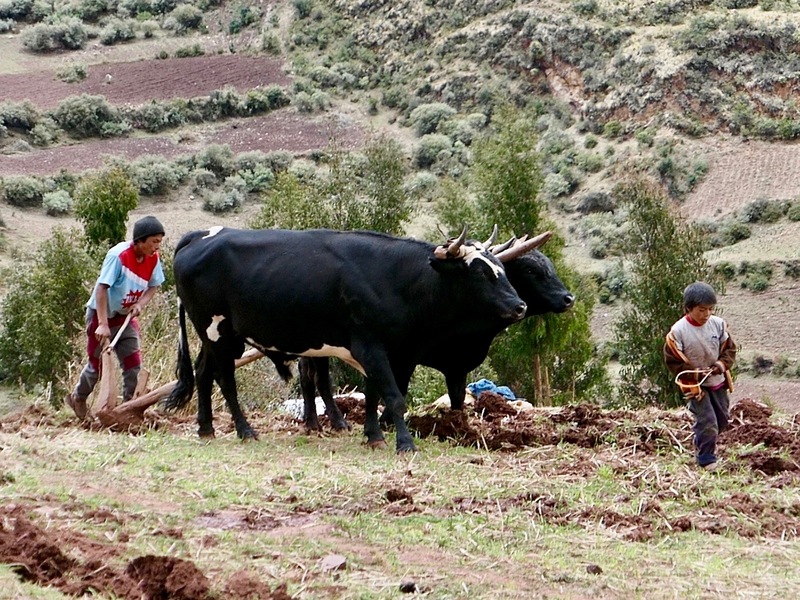 (Peruvians earn on average $500 per month–much less in the remote highlands.) She divided the tips into individual envelopes and selected some of us to write thank-you notes. After breakfast, Juan called the staff to attention. They lined up, as if facing a firing squad. One by one, we read our thanks and distributed the envelopes. I thanked Francisco, the assistant chef. Craig thanked the horse wranglers. We shook hands and said goodbye to them. The sun was shining as we headed downhill into the Sacred Valley. Soon we entered the Kachiqata quarry, a large rockfall below high stone cliffs and the namesake of the trail. Our way forward was a field of loose rocks, difficult to traverse. Here, Incan quarry workers once shaped blocks of granite by pounding with hammer stones. The blocks were then dragged down ramps and roads to a chute eight-hundred feet above the valley floor, where they were loosed downhill. Some weighed close to one-hundred tons. Several blocks were abandoned in the rubble field during the 1536 Spanish siege. We stopped to inspect a few of them. 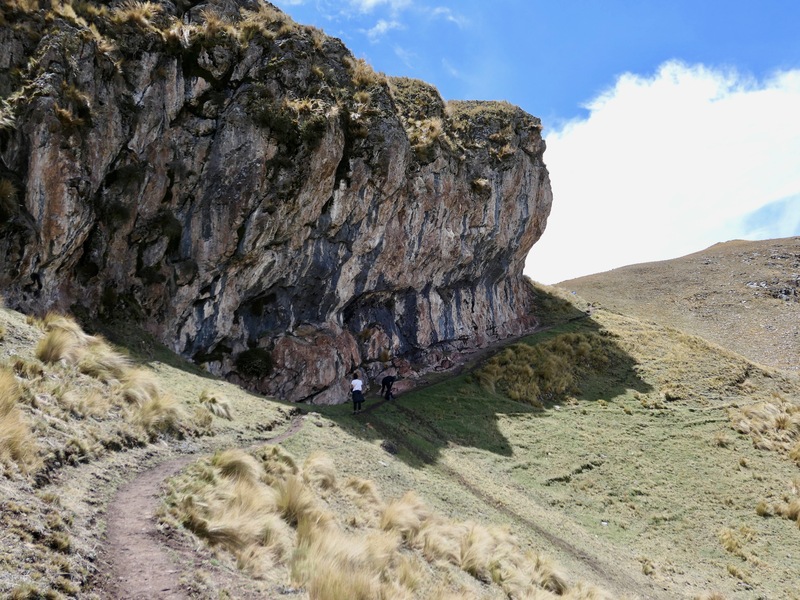 Juan led us to a small cave among the rocks that contained the bones of several Incan miners. Previous hikers had left offerings for the dead, such as flowers, bottles of water and energy bars. We passed several small stone huts, called chillpas, used as burial sites. Once past the quarry, the terrain leveled and the hiking became easier. 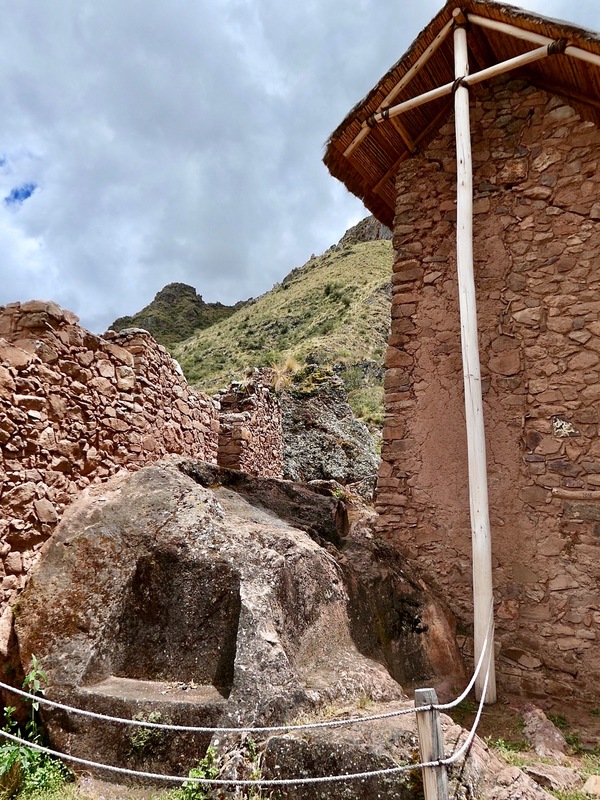 We continued down to the banks of the Urubamba River and crossed at Puente Inca, a wood-plank bridge sitting on huge square-cut foundation stones put in place by the Incas. The horses crossed ahead of us and climbed the stone steps on the far side into town. We entered the back streets of Ollantaytambo like weary refugees. Dogs sniffed us. Kids ignored us. At the market, women in bowlers and colorful sweaters sold corn, potatoes, carrots and lettuce from large sacks. On a restaurant balcony overlooking the town square, we celebrated our return with box lunches, packed in the morning by the camp staff. And we enjoyed the amenities. Flush toilets! Running water! Chairs with backs! Kleber gathered our hiking poles. We presented him with his tip. In an emotional moment, one of the hikers bequeathed his personal poles to Kleber. 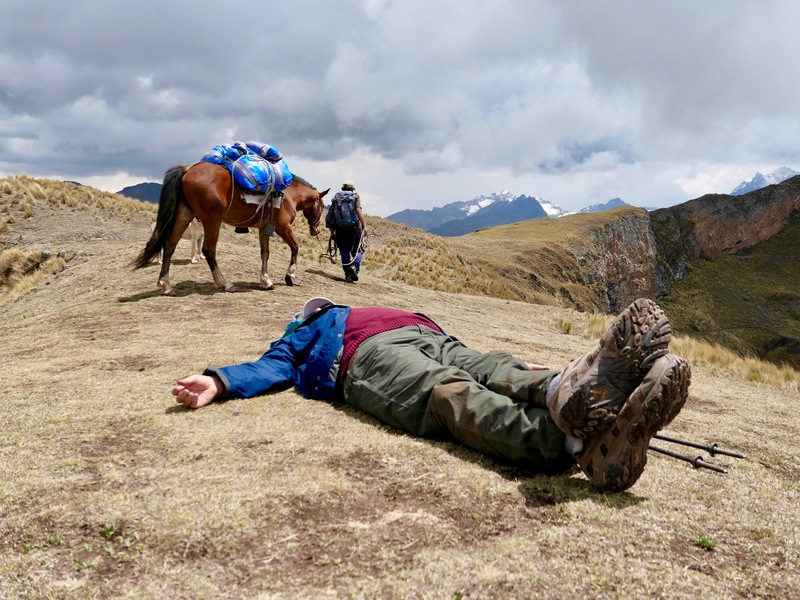 Apparently, his experience on the Inca Quarry Trail had convinced him never to hike again. Kleber seemed touched. We walked through Ollantaytambo to the train station, now carrying our duffels as well as our daypacks. Finally off of our feet, we enjoyed a short train ride along the river to Aguas Calientes. 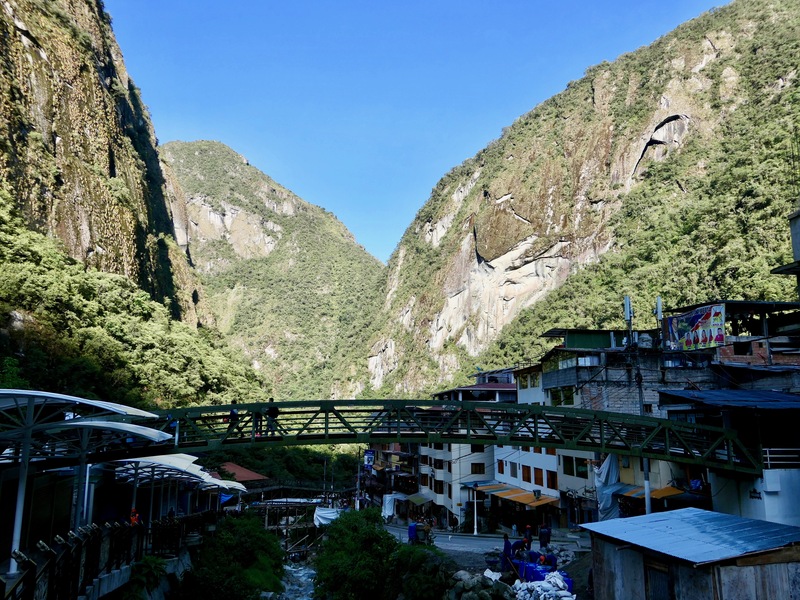 Aguas Calientes is the most convenient access point to Machu Picchu. 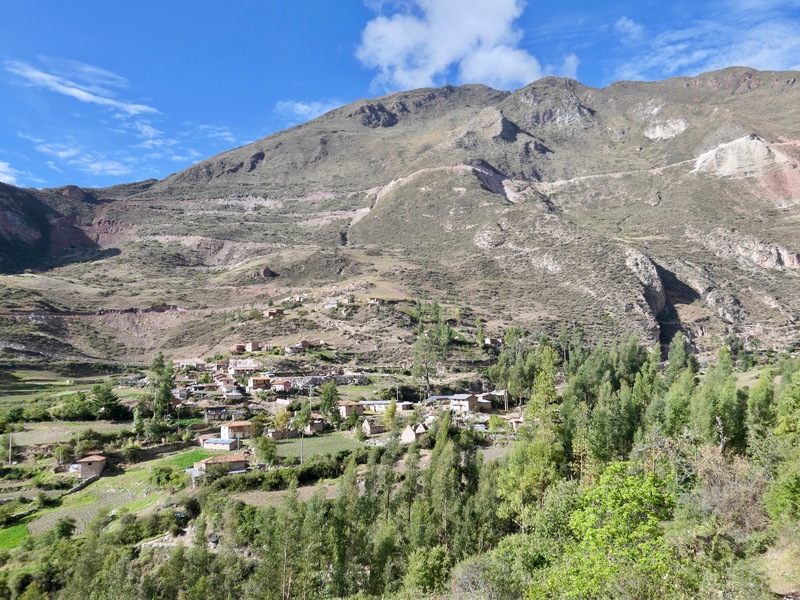 The town sits between stone cliffs along the Urubamba River at 1-1/4 miles high. Its population is around one thousand. The tiny town did not exist until the 1920s when Machu Picchu began to attract attention. Now it booms with hotels, restaurants and other tourist comforts, including its namesake hot springs. Upon arrival, we navigated the maze of souvenir stands selling woolen goods and checked into a hotel. More amenities. Beds! Hot showers! Slow Wi-Fi! Later, much refreshed and in good spirits, our group met in the lobby and walked to dinner. We left early for our tour of Machu Picchu (Old Mountain in Kichwa). Juan had prepared us to expect the usual fog, but it dawned clear and sunny. We were surprised to find no lines at the bus stop. The route to the top is a series of switchbacks on a narrow gravel road. Forty-five minutes later we emerged onto a terrace and were presented with the classic, breathtaking view of the city. The ruins of Machu Picchu spread across a ridge in front of Wayna Pikchu, a peak resembling a giant football on a tee. The site is circled by tree-covered mountains. 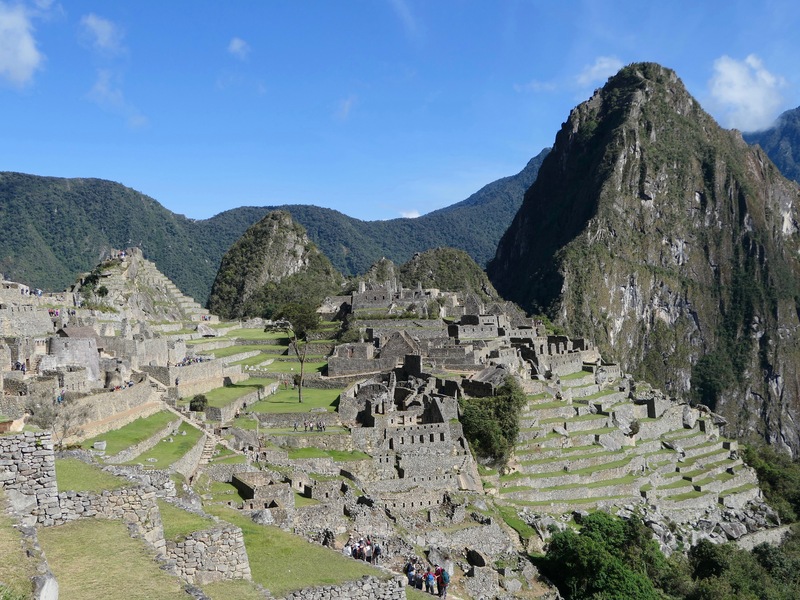 As one of the New Seven Wonders of the World, Machu Picchu lives up to its billing. The citadel’s uniqueness and remoteness enhance its appeal. Construction of the mountaintop city began around 1450. 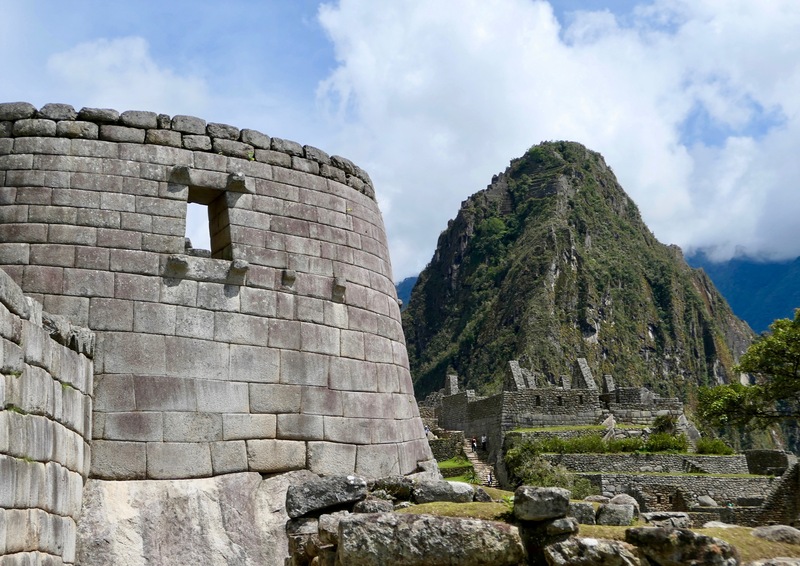 Most archaeologists believe Machu Picchu was an estate for an Incan king. The quality of its stonework suggests it was also a ceremonial center. Because eight access routes have been discovered, it was likely a trading hub. The Spaniards never found it and, as a result, missed the opportunity to destroy it. Over the centuries, only local farmers and a few treasure hunters knew of its existence. In 1911 American explorer Hiram Bingham III “found” the ancient city and brought it to international attention. Approximately two-hundred structures make up Machu Picchu, including a large square, a city wall and agricultural terraces. Engineers estimate that sixty percent of the construction is underground, consisting of deep foundations and drainage systems. We lingered at the overlook for a while, absorbing the view. The day was already hot. Finally, Juan led us around the site, explaining each feature. 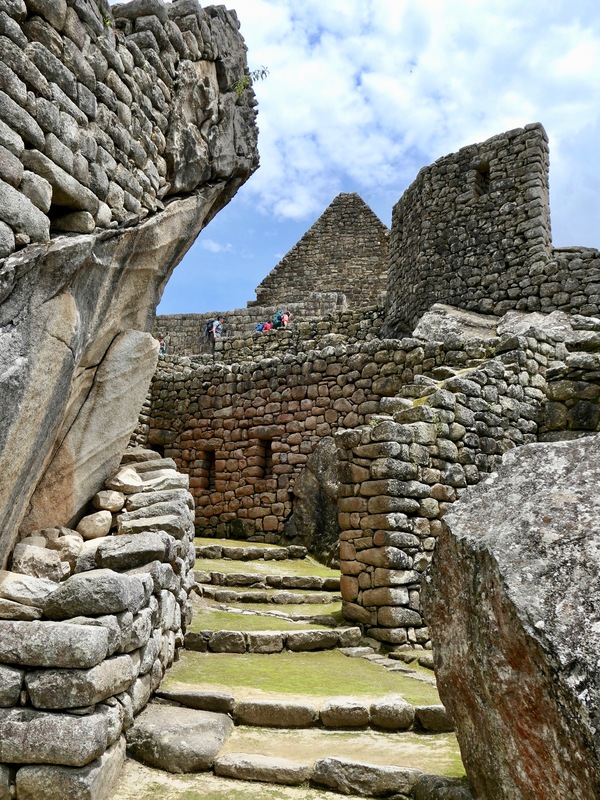 We made the designated stops, including the Temple of the Sun, a round tower; the Royal Tomb with sculpted steps and altars; the Temple of the Three Windows; Intihuatana, a stone shaped to predict the solstices, and the Temple of the Condor, a carving with outstretched wings. Indiana-Jonesing through the ruins of a once-powerful culture inspires reflection. What does it mean for today’s superpowers that one of the greatest empires the world has ever known so quickly flickered and died? The gold and silver may be gone, but the Incas left other treasures, including advances in engineering, agriculture, masonry and weaving. Recently Peru has worked to improve conditions for the descendants of the Incas (the Kichwa people) and to recognize their heritage. An image of Tupac Amaru II, the leader of an Incan rebellion against the Spaniards in 1789, is now on Peruvian currency. Schoolchildren can recite the names of all thirteen pre-conquest Incan kings. Inside the fine Incan walls, time seemed to stand still, but outside the empire had ended. We took a final group photo with the Old Mountain in the background, said goodbye and set off on new trails. One of your best, Kirk. Great pictures. Would love to see Craig again. Sounds like a fantastic trip. It all sounds vaguely familiar, unfortunately sustained oxygen deprivation keeps me from remembering the trip. Thanks for taking the time to fill in the gaps. For those of you that weren’t there Kirk has nailed the details and captured the feel of an incredible country with remarkable history, beautiful scenery and a friendliness I haven’t encountered elsewhere. And yes, the guy in the picture that looks dead at the top of a mountain pass is me. The picture wasn’t posed, I was just tired and enjoying a chance to catch my breath and a few rays. Thanks for sharing. Another great adventure. Loved this post. I am off to Death Valley on Saturday. Looking forward to it. What an ambitious trek and wonderful story, so well told. 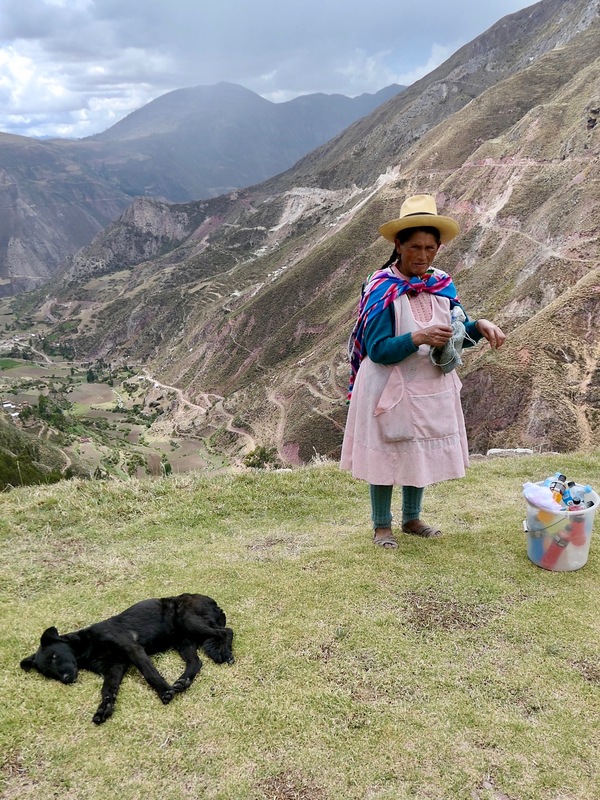 The questionable herbal coca tea sounds comforting, nearly as much so as the gorgeous colors of the local yarn. The sun on the glacier on Veronica must have been a stunning view. And Juan sounds like such a fun and competent guide. You gotta respect his description of the loose rock downhill trek as taking 2 1/2 hours or 5 minutes. Thank you for sharing your adventure. Would be interested to hear a bit about where the others are from and whether this was on their respective “bucket lists”. I assume none of the ten pictured was injured or became ill, except perhaps Craig, who may not be pictured. These ladies look tough and seasoned and one has interesting tattoos on her left arm. As I get a bit “heady” in the elevations in New Mexico and Colorado, I can imagine myself starting a month early to chew on coco leaves and then forgetting to make my flight to Peru. I try to imagine the latrine facilities at those altitudes and how the diet you described served perhaps your comfort on your trek. Any chance they have glider trips I could take to simply get the view from the air?